Aegean Islands, Italian Occupation Mint General Issues, Mostly complete mint collection (missing #CE3-CE4), mostly o.g. with a few sets n.h., generally Fine to Very Fine. Aegean Islands, Italian Occupation Mint Issues, Few hundred of the individual islands, missing only 10 stamps for completion, mostly o.g. with few n.h. sets, generally Fine to Very Fine. Argentina, Two Mint and Used Argentina Collections, one in Scott Specialty album to 1974 with some later loose pages, mostly used to about 1965, then mostly mint mixed o.g. and n.h., one mostly used on hand made pages to mid 1960's, a few earlies suspect, both incl. Back-of-Book, generally Fine to Very Fine. Argentina, 1862 to 1994 Mint and Used Collection, hinged on Scott pages, mostly used to about 1940, then mixed mint and used to about 1980, then all mint, incl. Back-of-Book, Officials weak, a few partially stuck down, generally Fine to Very Fine. Austria, 1863 to 1991 Mint Collection, o.g. or n.h., in mounts in 2 Schaubek albums, regulars mostly complete from 1905, incl. #128-144 with 142-144 n.h., missing the WIPA sheet, some of the German overprints and the Renner sheets, Back-of-Book sparse, Fine to Very Fine. Austria, 1850 to 1991 Collection, in 2 Schaubek albums, used except 1945-1947 and some Back-of-Book, incl. Offices, occupations, Bosnia & Herzegovina, generally Fine to Very Fine. Austria, 1945 to 1990's Collection, in 4 Lighthouse albums, with matching mint and used pages (later mint only), complete starting with reprints of Germany issues incl. 1m-5m, few signed, earlier mint o.g., later n.h., incl. Semis, Airs, etc., Fine to Very Fine. 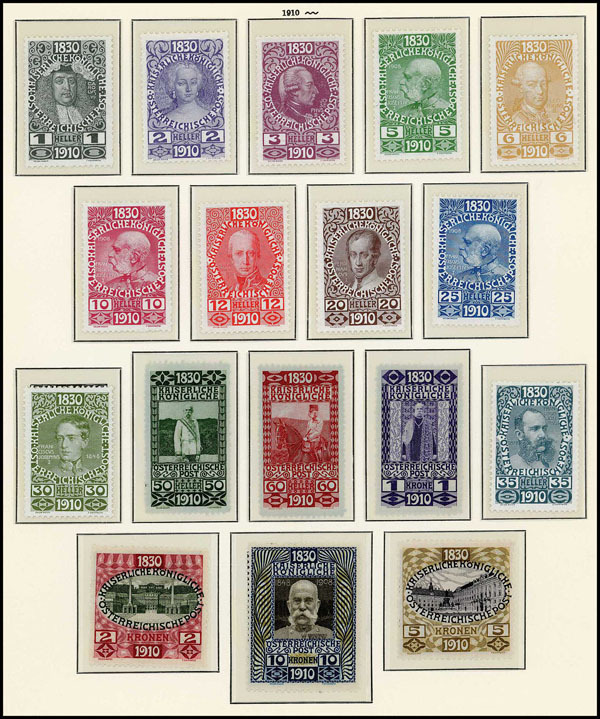 Austria, Extensive Two Volume Collection, Lots of classics and early 20th Century including mint and used #127, scattered better mint, including better post WWII sets, and onward to year 2006, includes strong run of Semi-postals with better sets like #B77-99, B106-09, B112-21, B128-31, B152-64, then almost solid mint onward, including C12-31, C58, plus extensive Back-of-the-Book, generally Fine to Very Fine. Austria, 1850 to 1989 Mint and Used Collection, Hinged and mounted in a Minkus album, mostly used up to 1915, fairly complete from 1929 onwards, generally Fine to Very Fine. Austria, Cover Group of 170, Mostly 1940s period commercial with censored from Zones, few 19th Century to U.S. incl. postcards, mostly to external destinations, few commemorative cancels, few unaddressed, Fine overall. Austria, 1850 to 1970 Mint and Used Collection, Hinged on Scott album pages, a good selection incl. Semi-postals, Airs, Dues, Military, Newspaper, Occupation etc., worth a look, generally Fine to Very Fine. Belgium, 1850 to 1987 Mint and Used Collection, Hinged and mounted in Minkus album, mostly used up to 1936, fairly comprehensive from 1954 onwards, generally Fine to Very Fine. Belgium, 1941 to 1999 Mint and Used Collection, hinged on Scott Specialty pages, largely complete, regulars mixed mint and used, hinged on Scott Specialty pages, mixed mint and used to about 1960, then almost all mint, Back-of-Book mostly mint except Parcel Post mostly used, a few partially stuck down, generally Fine to Very Fine. Belgium, & Colonies Two Volume Collection, In Scott Specialty Albums, strong in Belgian classics, good run of mint and used to year 2005, Semi-postals strong and include mint #B69-77, B93-113 (no B106), B123-24, majority of higher value post WWII sets are present, good Back-of-the-Book with extensive Parcel Post, followed by a decent run of Belgian Congo and Ruanda-Urundi, generally Fine to Very Fine. Brazil, Two Mint and Used Brazil Collections, one mixed mint and used on Minkus pages to mid 1940's, then mostly mint to late 1960's, many in mounts unchecked for hinging, incl. back-of-Book, one collection 1941-1993 hinged on Scott pages, mixed mint and used to about 1967, then mostly mint, a few partially stuck down, generally Fine to Very Fine. Brazil, 1846 to 2000 Mint and Used Collection, Mounted on Minkus pages and housed in a binder, 19th and early 20th Century mostly used, fairly well filled, generally Fine to Very Fine. Castellorizo, Complete Mint Collection, #51-89, o.g., generally Fine to Very Fine.